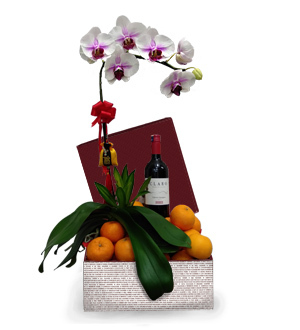 Live Potted Phalaenopsis Orchid in box of Mandarin Oranges 18pcs and a bottle of Chilean Claro Merlot 2017. Comes with care instruction - 3 easy steps instructions and 'things every potted live Phalaenopsis' owner need to know are included with the gift. As only the freshest potted Phalaenopsis are sent out, this Purplish Orchid may be substituted with other similar value Phalaenopsis (of different color) depending on availability. For availability of choice color, please contact our Customer Service at 03-78830233 / 012-6915200 or email us at sales@gift-lab.com. Available for delivery within Klang Valley (Kuala Lumpir, Shah Alam, Petaling Jaya, Ampang) and Selangor only. For out of Klang Valley delivery, Live Orchid may be replaced accordingly where delivery may be delivered via courier and at least 3 working days notice is required.